Dramatically helping to recharge groundwater storage is one of the major benefits of the proposal to build Temperance Flat Dam behind Friant Dam, located to the north and east of Fresno. The new dam would triple the storage that is currently available with Friant Dam. Mario Santoyo, the executive director of the San Joaquin Water Authority, is helping the organization prepare the package to submit to the Water Commission by the August 14 deadline. “We will have one of the strongest applications to receive monies,” said Santoyo, assuring that the water authority will receive the package on time. The numbers are in for the 2015 Tulare County Annual Crop and Livestock Report. Marilyn Kinoshita, Agricultural Commissioner/Sealer of Tulare County, reported, “We had an overall value of $6.9 billion, compared to last year, which was more than $8 billion,” which means the County led the nation in total crop value and dairy production, despite a decrease of nearly 14% in one year. Thus far, the reported 2015 county crop reports in the Central Valley are down this year. “Fresno County, for instance, was down 6.5% off its record $7 billion in 2014,” Kinoshita said. “It has a lot to do with low water deliveries in Fresno and Tulare Counties,” she continued. “The smaller the water deliveries, the more efficient those growers have to be with that water. Anytime you’re pumping water out of the ground, it’s terribly expensive,” she noted. “Some of our growers have had to decide, ‘All right, I’ve got this much water; I’m going to keep those blocks alive and I’m going to push an older block that isn’t producing as well.’ The returns aren’t as good as some of the newer plantings,” said Kinoshita. Despite all of that, Kinoshita said agriculture does sit at the head of the table in Tulare County. “Yes, and we need a successful Ag industry to thrive here,” she said. To view a video of the interview, click HERE. Blattler acknowledged the crop value numbers do not reflect net revenue for growers. “It’s always really important for our listeners to know that the crop value is a gross revenue number. When our Ag Commissioner steps to the microphone and speaks to our Board of Supervisors about this report each year, she’s reflecting values that are attributed to all of the gross revenue, and it’s not only the field value,” Blattler said. “That gross number reported each year also represents our packing houses, our milk processing facilities—the creameries, the butter plants—the packing sheds, all those other parts of our industry that [create] value in our industry,” said Blattler. Blattler noted up or down, it’s all about the resiliency of farmers. “The industry has its years that are really blockbuster and it has its years when it falls back and we see a reduction acreage. We see reductions in surface water deliveries. The drought is still certainly playing a significant role in the numbers we’re seeing,” she explained. With regard to surface water, Tulare County is in a bit of a unique position. “As an Eastside county, some of our water deliveries are not as subject to the situation that the Westside is in. In the same sense, we have some significant cutbacks that have been attributed to the San Joaquin River’s restoration and the biological opinions in the Delta—all have had an impact on the Central San Joaquin Valley [water] deliveries regardless of whether you’re Eastside or Westside. “Also, as the exchange contractors either take greater deliveries of water or give up water, that also impacts the amount available to Eastside growers here in Tulare County,” she said. In summary, 2015 Tulare Crop Report covers more than 120 different commodities, 45 of which have a gross value in excess of $1 million. Although individual commodities may experience difficulties from year to year, Tulare County continues to produce high quality crops that provide food and fiber to more than 90 countries worldwide. California Ag Today staff interviewed Ryan Jacobsen, CEO and executive director of the Fresno County Farm Bureau moments after the Bureau of Reclamation announced only 5 percent of contracted water would be allocated to Federal surface water users south of the Sacramento Delta during this El Niño year. Jacobsen: Absolutely just despicable—the announcement we heard earlier today. The frustration is that we’ve continually been told over the last couple of years with zero percent water allocations that it’s been Mother Nature. Even though it’s not necessarily the big bang year we were hoping for in northern California, Mother Nature provided. We’ve seen the reservoirs overflowing. We’ve seen the reservoirs flood-releasing, and here we are with a five percent allocation. We saw outflows in the delta this winter that exceeded the 300,000 acre/feet a day, and yet we weren’t doing anything to capture it. So, it’s just frustration, frustration, frustration that here we are—more of the same—and what does this mean long-term for California agriculture? We can’t be viable without a surface water supply, and when Mother Nature provides, unfortunately the federal government’s not trying to collect it. California Ag Today: What is going on? Why are they doing this? Do you have any theories? Jacobsen: Obviously, it has so much to do with the environmental side and the belief that the federal government is doing all they can to protect these species up there. We have seen that it’s doing no good; the fish species are seeing no recovery; it’s actually going in the opposite direction. It is plain mismanagement. The unfortunate part is sound science isn’t even going into this right now; it is purely the emotional side of whoever decides to pull the trigger on the federal side. And here we are on the resulting end, losing millions and millions of dollars in our economy, idling more farmland—the most productive farmland in the country—in the world—and losing the jobs that are associated with it. California Ag Today: You speak brilliantly on this whole situation. Way more water has flowed out to the ocean than needed for the protection of any of the species or the environment, so who are they listening to? Jacobsen: Right now, this is simply the administration’s decision. Reclamation falls under the federal side of things, so obviously, ultimately, it lays on the President’s desk. If we talk about resolution: by 9 a.m. tomorrow morning, we could see a resolution to this whole issue. If Congress would get their act together and pass some kind of bill, get it on the President’s desk and get it signed, we could see some resolution. Unfortunately, here we are, April 1: a good portion of the precipitation season is now behind us, the high flows through the delta are pretty much over. We still have healthy reservoirs up North, but unfortunately it doesn’t mean anything for us down here because we can’t convey it through the Delta to get here. That lack of and the lack of ability on the federal side to make the decisions that would allow us to pump that water makes this just another year of doom and gloom. Again, how much more of this can we take? I think the long-term outlook for those farmers with permanent crops who have tried to scrape by, has to be, “Is this even viable for us to continue to do this anymore?” ‘Because Mother Nature provided, and yet we don’t see the water. California Ag Today: Very bleak. Ninety-five percent of normal snowfall, too. Jacobsen: The percentages in northern California, while good, weren’t the El Niño banner year we were expecting. The season looked bright, like it was going to be good. Yet, the fact of the matter is that during the months of January, February and March, when these just incredible numbers of high water flows were going through the Delta, pumps were pumping in single digits. And that’s not even close, or anywhere near where they should have been. I think the misconception is when we talk about the water that is taken from the Delta, it’s such a small percentage, particularly during those high-flow times; it would have meant no difference to water species. It’s just a frustration that we continue to be bombarded by these environmental restrictions that are having no good effect on the long-term viability of these species they are trying to protect. California Ag Today: What is the economic impact of these water cutbacks on the Central Valley? Jacobsen: Well, when you look at the five percent allocation, we are ground zero. Fresno County, right in the heartland of the Central Valley, is ground zero. We are going to see probably in excess of 200,000-250,000 acres of land continue to be fallowed and the loss of the tens of thousands of jobs associated with that, and millions, tens of millions of dollars. It’s obviously a very dire situation when it comes to long-term viability here in the Valley. California Ag Today: Because they are going to hear a lot of outrage from us, do you think the Bureau of Reclamation would go to a 20 percent water allocation? Farmers must be thinking, “We got to get the seeds ordered today for the crops.” Is there any hope for an increase in water, or do you think farmers just can’t bank on it? Jacobsen: It’s already too late. For this season, it’s already too late. It is April 1 already, and, unfortunately, this is not a joke. This decision is about one month-and-a-half late. I think the Bureau of Reclamation was hoping the numbers would improve magically. They didn’t. The five percent allocation, while said not to be our final allocation, is likely to be close. It won’t go up to 20; it won’t go up to 15. Maybe if we pray enough, it may go up to ten, but that would be on the high side. Right now, it looks very realistic that five percent is where we end up, where we are going to stand for the year. California Ag Today: Okay, I know growers who have planted tomatoes in Fresno County, thinking, “Hey, we gotta get water.” They’re not getting it. Jacobsen: They’re not getting it, no. And lack of surface water supply continues to make a huge dent in our groundwater supply, so this just can’t continue the way it is going. Plus, upcoming implementation of the Sustainable Groundwater Management Act (SGMA), combined with the lack of federal surface supplies, will absolutely hammer farms here in the Valley. 2015 Drought Costs Ag Nearly Two Billion! In 2015, the drought costs to the state’s agricultural economy will reach about $1.84 billion and 10,100 seasonal jobs, the report estimated, with the Central Valley hardest hit. “We’re getting by remarkably well this year — much better than many had predicted — but it’s not a free lunch,” said lead author Richard Howitt, a UC Davis professor emeritus of agricultural and resource economics. “If a drought of this intensity persists beyond 2015, California’s agricultural production and employment will continue to erode,” said co-author Josue Medellin-Azuara, a water economist with the UC Davis Center for Watershed Sciences. Surface water shortages will reach nearly 8.7 million acre-feet, which will be offset mostly by increased groundwater pumping of 6 million acre-feet. Net water shortages of 2.7 million acre-feet will cause roughly 542,000 acres to be idled — 114,000 more acres than the researchers’ 2014 drought estimate. Most idled land is in the Tulare Basin. The scientists noted that new state groundwater laws requiring local agencies to attain sustainable yields could eventually reverse the depletion of underground reserves. Author webmasterPosted on August 18, 2015 May 31, 2016 Categories Know the issues, University of California, Davis, California Department of Food and Agriculture, Agriculture Jobs, Economics, Price, Environment, Labor, National Agriculture News, UC Agricultural Issues Center, Water, California Agriculture News, press release, San Joaquin ValleyTags: Daniel Sumner Groundwater surface water Jay Lund land subsidence Central Valley Richard Howitt UC Davis Center for Watershed Sciences agricultural and resource economics aquifer Tulare Basin Josue Medellin-Azuara water economist state and federal water projects water districts Duncan MacEwan seasonal jobs farm productionLeave a comment on 2015 Drought Costs Ag Nearly Two Billion! California’s groundwater is back in the spotlight. Largely invisible, lightly regulated and used by 85% of California’s population and much of the state’s $45 billion agriculture industry, groundwater is a crucial reserve that helps stave off catastrophe during drought periods like we’ve experienced over the past three years. But after more than a century of unregulated use, California’s groundwater is in crisis – and with it the state’s hydrologic safety net. This carries profound economic, environmental, and infrastructure implications. How did it come to this, and what do we do now? Through numerous hearings, workshops, and consultations with experts and interest groups, recommendations by groups such as the California Water Foundation are coalescing around the concept of local groundwater management with the state serving as a backstop authority if local action has not occurred or is insufficient. Next steps might include creating and empowering local groundwater management entities; requiring groundwater management plans; and defining the state’s role for assistance, oversight, enforcement and funding. Read more in the California Water Foundation’s report with recommendations for sustainable groundwater management. Shawn Stevenson is the Vice President of Harlan Ranch, a third-generation family-owned and operated farm located in Fresno County. He says this is the toughest time the ranch has experienced in its history. Stevenson spoke as a bulldozer uprooted productive trees last week. “Once we finished pushing these trees, we’re going to be out about 400 acres of the 1200 acres that’s pushed. In addition, we have another 140 acres we’re just giving enough water to barely keep alive,” said Stevenson. “The balance of our crops are receiving 66 percent of their normal water. So no matter what kind of crop that is out here on Harlan Ranch this year, it’s a very tough year as far as water goes,” he added. Stevenson explained that the lack of water isn’t just about crops, but the people involved as well. “There’s not enough water. It impacts the trees. It impacts our employees. Earlier this year I had my first layoffs I ever done because of lack of work, and that’s because we are pushing out so many trees. About 30 percent of our employees were let go. That was the probably the most devastating time that I’ve faced here,” said Stevenson. He added that this reaches far more than just his farm, that the drought permeates all aspects of the industry, not just growers. “Now, I understand not all of Fresno and not all of California looks this bad, but imagine that we’re like the “canary in the coal mine”. This is what the future of California looks like. This kind of devastation that you see here is what our future looks like. If we continue to have no or little surface water deliveries, and as the groundwater situation continues to deteriorate. Without more surface water, without more water supplies, this is the future of the Central Valley,” said Stevenson. “Several months ago, I looked back at what the worst case scenario would be and started making plans for that worst case scenario. And, the worst case scenario is about right on track. I don’t think a lot of people realize that is like a natural disaster, like Hurricane Katrina, or a wildfire or an earthquake, it’s just going to take a lot longer time to happen. It’s going to happen slowly—the devastation to our economy, to peoples’ lives, to whole communities,” he said. “Our water infrastructure has been far out-stripped by the people in this state, so it’s time we update it and figure out how to get more water to more people in the state and try to preserve agriculture for our state, our country, and our world,” Stevenson said. For the first time in history, Fresno County has two $1 billion crops, and for the first time in 11 years, grapes are not the #1 crop. Now almonds are the top crop produced in Fresno County with a value of $1.1 billion, with grapes coming in second at $1.03 billion. However, despite these highlights, Fresno County crop value in 2013 was $6.436 billion in gross production—a decrease of 2.28 percent of 2012. As it stands now, Fresno County loses it’s #1 position as top agricultural county in the nation, dropping behind Tulare County, which recently announced a $7.8 billion 2013 crop year. It could get worse when Kern County releases their report in August. Water shortages in Fresno County with a large part of the West Side dependent on both state and federal surface water deliveries have meant the annual crop report’s gross value of production has dropped three years in a row. Details of the 2013 report include an increase of fresh vegetable production in 2013 by 3.8 percent in value led by garlic and fresh market tomatoes, while livestock and poultry decreased in value by more than 16 percent. Field crops, representing barley, wheat, corn silage, cotton an alfalfa declined nearly 42 percent, while fruit and nut crops increased more than 8 percent. Wright noted that Fresno County growers exported nearly 26,000 shipments to 99 different countries. “This tells us that we are still feeding the world,” said Wright. 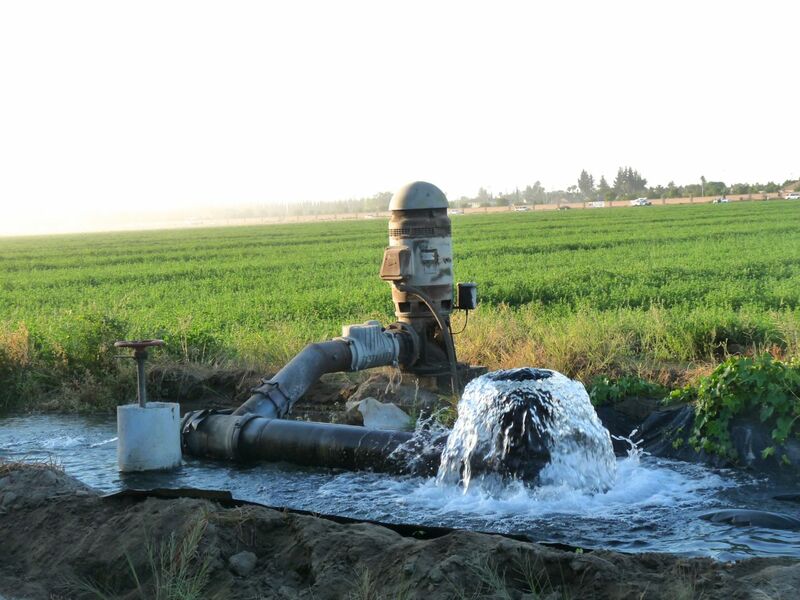 Merced Irrigation District officials say growers in the district will receive additional surface water, after action taken Tuesday by MID’s board of directors. The increased water supply is the direct result of regulatory relief MID received from the state after months of planning a multibenefit water management action for the Merced River, according to a press release from Mike Jensen, MID spokesman. MID growers were most recently expecting 0.9 acre-feet of surface water supply this growing season. However, MID officials noted increased water supply would be available, and recommended increasing the allocation to 1.1 acre-feet of water per acre. Class II growers will receive 0.55 acre-feet after Tuesday’s MID board action. Deliveries are expected to continue until Sept. 7, according to Jensen. The reduction in the 2014 water rates comes after MID growers recently approved a rate increase to $100 per acre-foot, ensuring the financial health of MID during the drought crisis. Since that time, MID implemented the multibenefit water management action for the Merced River after months of planning and receiving final approvals from the state. It involved obtaining 25,000 additional acre-feet of water from Lake McClure for growers, and providing 5,000 acre-feet of water for a critical-year spring fish-flow in the Merced River. The spring fish-flow water was transferred to other water users after it served its environmental purpose in the river system. MID received $5 million in revenue to help the district recover lost revenue associated with the drought.